12 June 2013 – An awesome birthday card!!! My birthday was at the end of January and my amazingly talented Stampin’ Sister, Jess, sent me an absolutely awesome birthday card!! She is sooo talented!! Check out her blog here. I didn’t have the same stamp set that she had used, so I improvised with what I had. I used the Delicate Doilies stamp set (which I love!!) 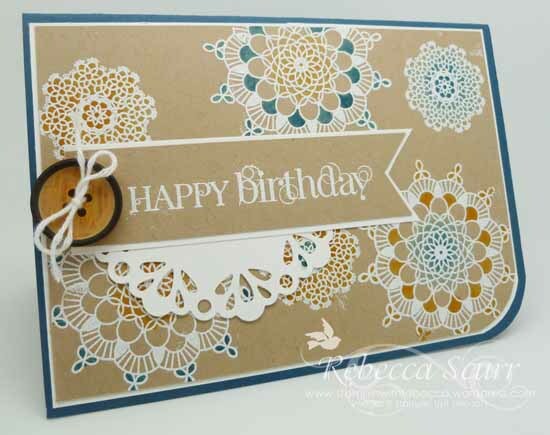 and embossed each of the “doilies” with white embossing powder. I then coloured them using markers and blenders pens. I just love the rounded corner which I tried to punch out but was a dismal failure so I ended up cutting it by hand. Sometimes, you just have to go the old fashioned way!! I also love the Delicate Doilies Sizzlit!! Too pretty!! Accessories: Big Shot, Delicate Doilies sizzlit, White embossing powder, heat gun, blender pens, Naturals Designer Buttons, Whisper White Baker’s Twine. I hope you are enjoying the retirement list!! Contact me for more info or to place an order, stampinwithrebecca@yahoo.com.au or phone 0408 193 792.